By default, Intalio BPMS Enterprise Edition is configured to run against a Derby in-memory DB. This DB configuration is pretty handy and make Intalio an out of the box tool for deploying and executing business processes. Nevertheless, as soon as you'll be considering integrating Intalio to a production environment, you'll may also consider having Intalio run against a more robust RDBMS for different reasons : crash recovery facilities, backup & restore procedures, and so on. 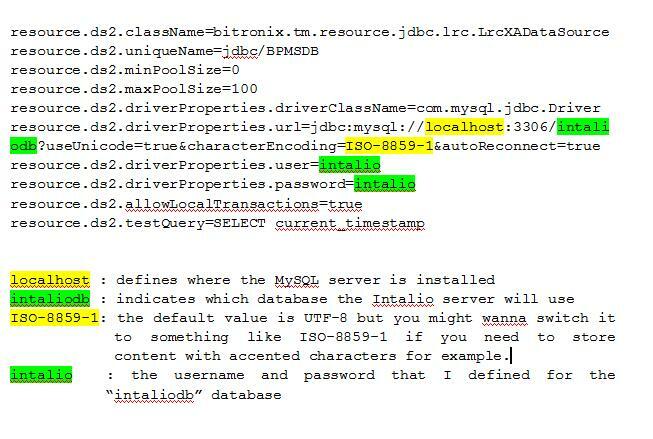 Most of the most popular RDMBS are supported by Intalio BPMS but the Community Edition only supports MySQL. 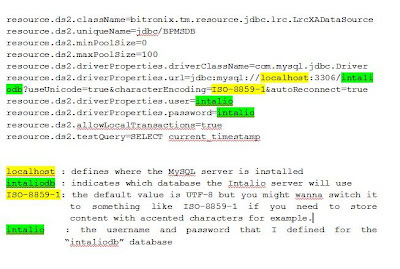 This post describes the procedure to follow to have Intalio BPMS run against a MySQL DB. Now that we've replaced the default Derby database server by MySQL, all we need to do is redeploying the existing processes so that their associated info are stored in the MySQL server. To do that, start your Intalio server and then delete all the files with the .deployed extension in the %INTALIO_HOME%/var/deploy directory. The deleted file should be recreated after a few seconds, which is the time the Intalio server needs to hot-redeploy the processes. 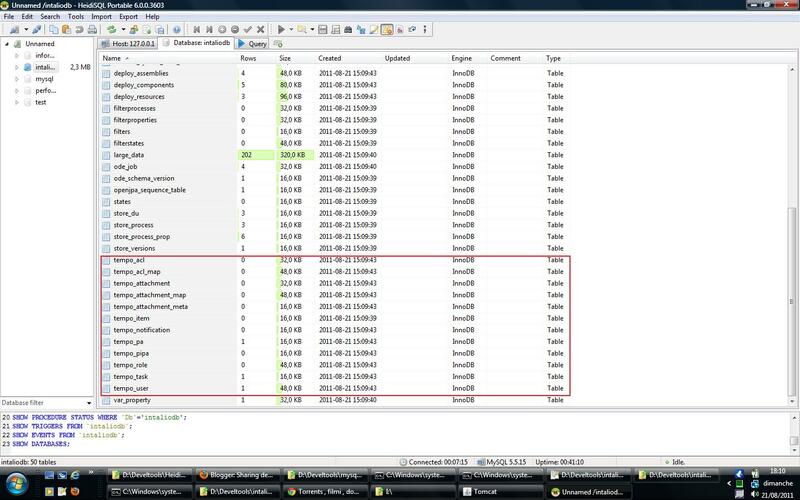 In order to check that your new Intalio configuration runs smoothly, you could run some of your existing processes (preferably, some with tasks or notifications) and then, check what is actually stored in the database. Could you provide post on Intalio process using JSP/JSF/PHP/Flex/.NET etc as UI interface. What do you mean exactly, by using these technologies as UI? Integrating the tasks/notifications in your own UI layer? Or integrating the UI-FW console? Integrating the tasks/notifications in own UI layer. To integrate the tasks/notifications in your own UI layer, I guess you'll have to either invoke the web services that Intalio provides (token management service , task management service, ...), or you can have implement a business layer that would query the DB in which the tasks/notifications related info are stored. 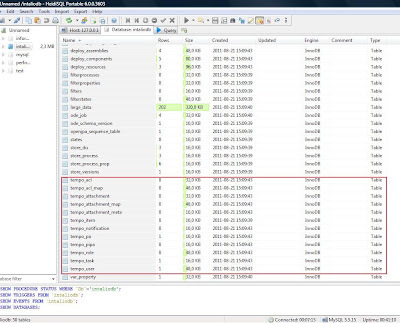 One last possible solution would be including the existing tasks/notifications jsp file provided by Intalio, in your own UI in case you've choosen a technology that support this kind of thing. 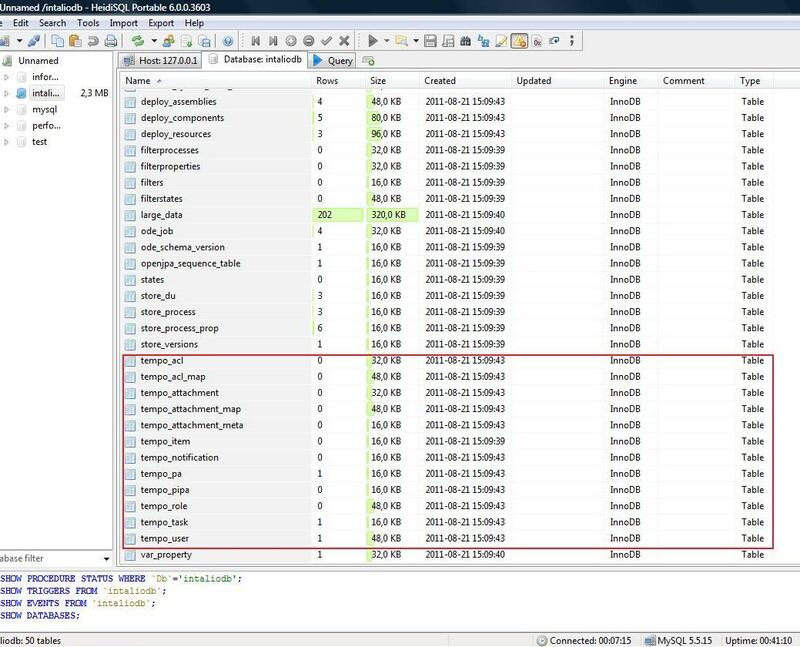 For instance, if you've developped your own UI using JSP, you would be able to include whole or part of existing JSP files. this application is a web site ! or please give us your mail for more detail ! I'm posting every example or tip that I consider relevant. In my company, we are currently integrating Intalio with an RCP client. If you have further question about Intalio or some topic that we could explore, feel free to leave a comment. Maybe you could provide more details about your instance failure (error message, logs, ...)? i need to implement sample poc on intalio bpms that is used for android mobiles by consuming intali web services. I'm glad to hear you got interested in my posts. Unfortunately, I haven't worked with Intalio for almost 3 years. Also, I have no experience with Android programming so far, so I guess I won't be able to help you at this moment.